After upgrading from 4.11.3, I have two nodes called "Packages" and "Relation Types" in the Dev Section. Yes, I noticed that as well. Overwriting trees.config with a fresh fixes it, but it shouldn't happen. Yes, overwrited trees.config, This bug will disappear. That's curious. When I compared the trees.config from the 6.0 package to the one on the server they were identical except for some blank lines and the date. However, overwriting the one on the server did indeed resolve the issue. I'm curious as to how you upgraded the site, which resulted in this. Did you leave the tree.config from the previous version, overwrite it with the one from the v6 package or merge the two? I have tested the upgrade a few times, but haven't seen this issue before. So steps to reproduce is greatly appropriated. Also, please post the tree.config after your upgrade with the duplicate trees. Based on the differences between the 4.11.3 version and the 6.0 version I am quite sure I overwrote the old one when I copied all the files. I have a few more site that I'll be upgrading soon so I'll pay closer attention on those. In addition, I've enabled verbose logging in Beyond Compare so I'll be able to supply details on future upgrades. Make sure not to just overwrite the files - I suggest you merge them using winmerge instead. I advise you to do so because it can cause trouble if you just overwrite the files if you are making use of packages etc. 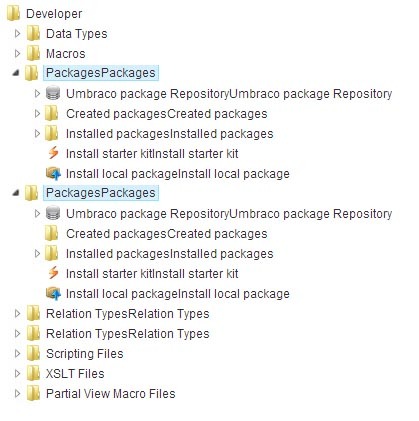 that writes to the files or if you have some custom configuration in the umbracoSettings.config for instance. I was not able to replicate this reliably, but I did just see the same issue during an upgrade. It feels like there is some item cached somewhere, while the trees.config did not have duplicates, the issue still appeared in the backoffice after upgrade. I replicated it simply by adding a definition in the trees.config twice. You then see the item in the tree twice. If you then open said item, switch to a different section and come back to the section with the open tree, the tree leaf's name gets duplicated like in the screenshot (PackagesPackages). If you do not have duplicate definitions in your trees.config then I believe a simple recycle of the app pool should to be enough (easily tested: add a space to the global.asax and save it). A possible fix/workaround could be in ApplicationTree.cs line 398 - Check if in the current section (applicationAlias), the same type already exists and then don't add that to the list again (so the combination: developer and umbraco.loadPackages can only exist once in the tree being built). However, I will need Shannon's input to verify that this is the way to go. I'm pretty sure that I restarted the app pool manually. In addition, I always change the SSL-settings in the web.config since the install fails when it's enabled - so that also would result in a restart. The trees.config file did not contain any duplicates, by the way. @Arie are you still seeing the duplicates now or did you roll back? Which version were you coming from by the way? They might be remnants of when we still stored the trees in the database. I believe that changed in 4.9.0 but I'd have to check to make sure. @Sebastiaan - I upgraded from 4.11.3. Not sure what version originally was installed before upgrading to 4.11.3, though. The problem was resolved when I copied the trees.config from the package again, though. Strangely, aside from some blank lines the versions were identical. @Arie thanks! I have seen it before just can't reproduce. I know with the above change that it will not happen again, just waiting to see if Shannon has anything to add before I implement this. If I'm seeing duplicate folders in 6.0.5 after upgrading, is there anything I can do? @Jason this type of error usually occurs when there are duplicate entries in trees.config. Check that the Package tree only appears once and ensure that you probably clear cache after the upgrade (issreset etc.). I'm recycling the app pool and stopped/started the website. Do I need to reset the entire IIS? Of note, this is an upgrade that has gone from 3.0 -> 4.0.3 -> 4.5.2 -> 4.7.2 -> 4.11.8 -> 6.0.5. Here's my trees.config. Anything look odd? @Jason Looks good, would love to get a copy of the site + db if possible so I can do some debugging on it. Had a few more reports of duplicate trees. You can either attach a zip to this issue here and set visibility to just the HQ or you can mail me a link (not a file, gmail rejects large files) dropbox, google drive, etc. Of course all information will be treated with confidentiality. Thanks in advance!